Melodic Intersect’s third album brings together musicians from all backgrounds and have enabled us to build from the experiences we had from the previous albums. In this album, we chose to go with a greater mix of production and improvisation. We actively used various different sounds and instruments in the Western & Eastern traditions. 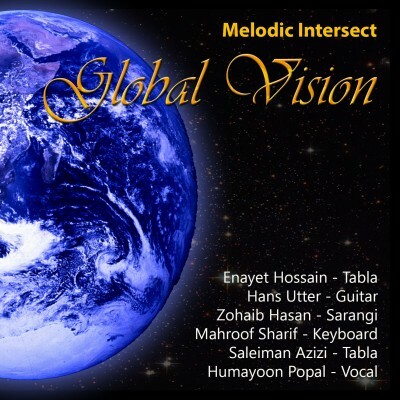 Enayet Hossain is on the tabla, a Indian Classical musician and one of the core members of Melodic Intersect, Enayet has been involved in all the previous albums. His growth from an Indian classical musician to a fusion artist can be seen in the various albums of Melodic Intersect. Still a traditionalist, Enayet reaches out to his training in Indian classical music to add substance to his fusion work. Hans Utter, a world class guitarist and sitarist is responsible plays and has arranged many of the tracks on the album. Hans has a track record of playing with some of the greatest bands from the Western world and is a fantastic sitarist as well. Together, Hans & Enayet envisioned, arranged and composed many of the tracks on this album. Zohaib Hasan, Pakistan’s top Sarangi player provides beautiful compositions and a wonderful sound of the ancient instrument, the Sarangi. He has many recordings to his credit and is considered one of the top 10 Sarangi players in the world today. Mahroof Sharif, hails from Afghanistan and is one of the most recognized keyboard player in the United States today. He is a composer himself, and provides great accompaniment when needed and has the ability to solo whenever needed. Saleiman Azizi is also from Afghanistan and known as one of the top Afghan tabla players in the United States. His knowledge of classical music and popular Afghan Folk music has enabled him to seamlessly blend into the album. Humayoon Popal, also from Afghanistan provides beautiful vocal support to the album. At times, forceful and other times serene and sensitive. He has been trained in Indian classical music as well as Afghan music and provides an excellent twist to the otherwise instrumental album. The following are a glimpse of the tracks in the album. They are excerpts from the album.